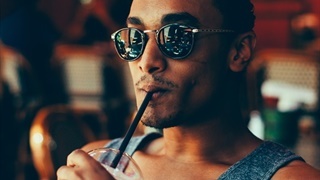 Adventure travelers, this one's for you. Svart Hotel Norway is getting attention for its groundbreaking combination of design and environmentalism. 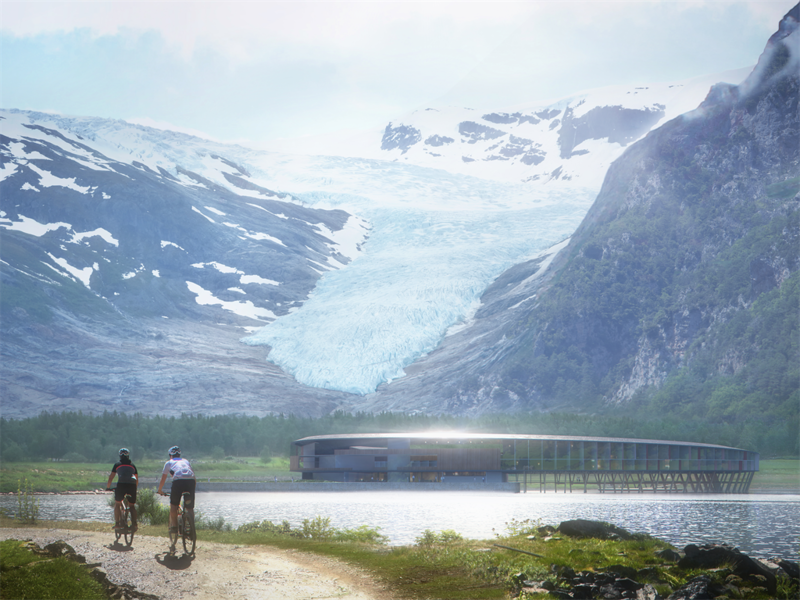 Renderings show that the design is a complete circle, and it's set at the base of a glacier. 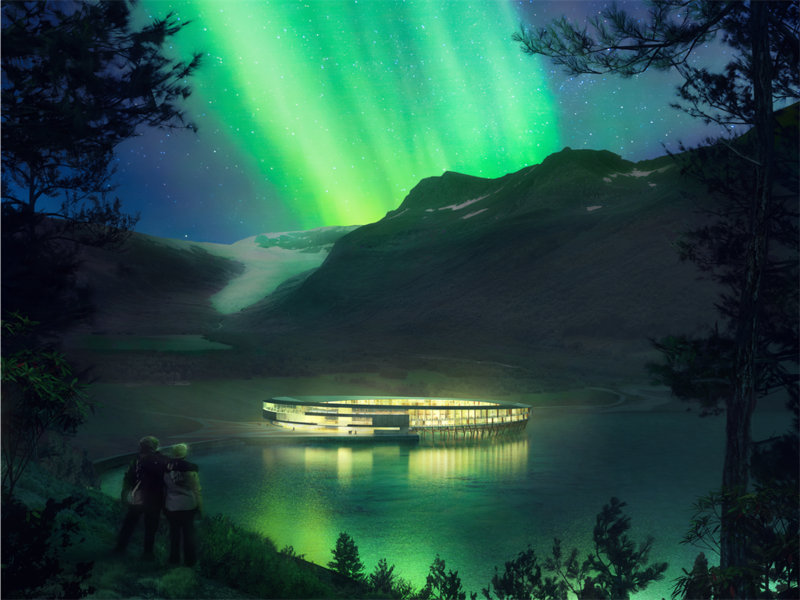 If the eye-catching design is not enough, consider its eco-friendly origins - and its broader location: Svart Hotel is set to be the world's first energy-positive hotel above the Arctic circle. In fact, according to a press release, the hotel will use 85% less energy than a traditional hotel in addition to producing its own energy. The hotel will be in northern Norway, in the Meløy municipality at the foot of the Svartisen glacier. For frame of reference, that's about 1,300km north of Oslo, the capital of Norway. 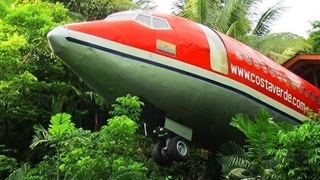 The location also served as inspiration for the project in more ways than one. 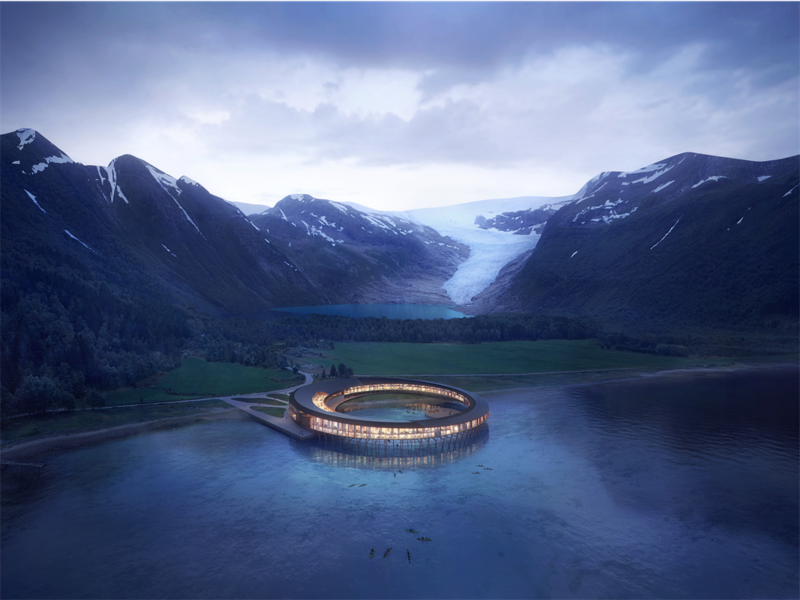 "Building an energy positive and low-impact hotel is an essential factor to create a sustainable tourist destination respecting the unique features of the plot; the rare plant species, the clean waters and the blue ice of the Svartisen glacier," Kjetil Trædal Thorsen, Founding Partner at Snøhetta, said in the hotel's press release. 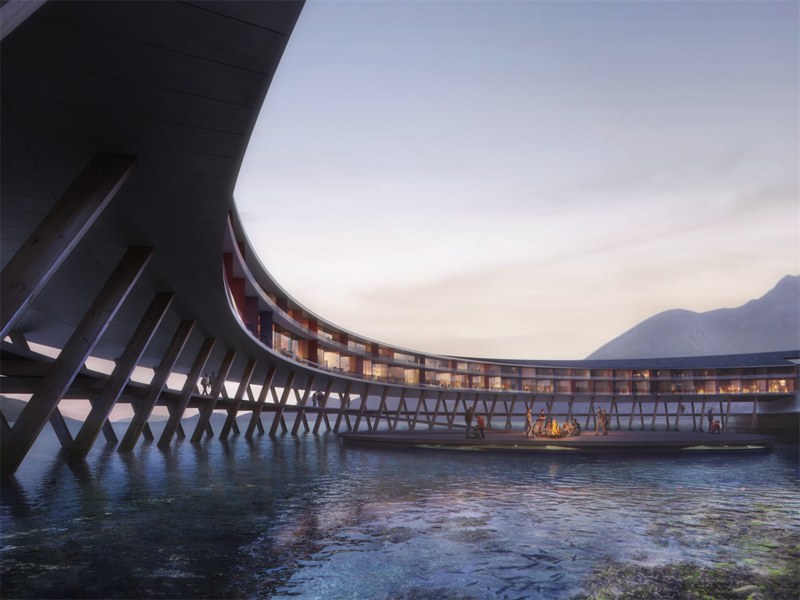 Though the hotel isn't set to open until 2021, the zoning plan was approved by the municipality ofMeløy in October, and, judging by its sleek design, it's likely to quickly lodge itself onto lists of hotels everyone has to visit in their lifetimes. 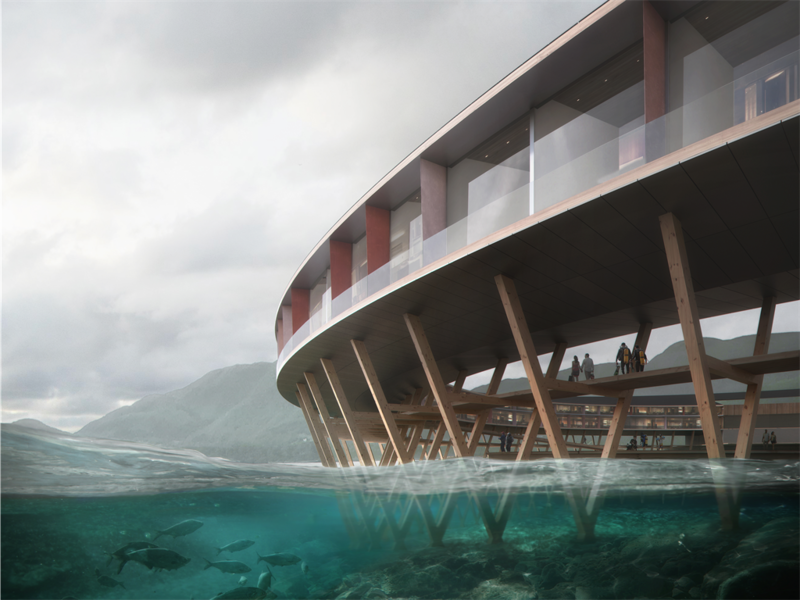 The circular frame of the hotel will extend from the shoreline and into the Holandsfjorden fjord in northern Norway. The distinctive shape of the hotel was designed to give guests panoramic views of the fjord. The name of the hotel itself is a nod to its surroundings: "Svart" means "black" in Norwegian, which is a tribute to the dark colour of the Svartisen glacier's ice. Because the hotel is located above the Arctic Circle, winter nights are long — which means they could afford the perfect opportunity for revelling in the beauty of the Northern Lights. Every element of the hotel's design is part of a carefully constructed plan. The poles of the hotel, visible in the rendering below, will have dual use throughout the seasons. In the summer, they'll function as a boardwalk, and in the winter, they'll function as kayak storage. In fact, kayakers will even be able to paddle directly under the hotel — but that's far from the only outdoor activity available to future guests. On its website, Svart Hotel bills itself as an Arctic adventure destination, where guests can "practice yoga in the midnight sun, dive in spectacular waters and harvest local delicacies." 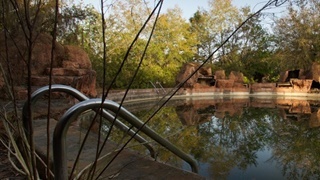 Ice climbing, night fishing, and paddling will also be within guests' reach.